Guys on the practice squad or “scout team” are there to give the offense or defense a quality look in practice. According to Aaron Wilson of the National Football Post, Ryan Tannehill received too good a look, constantly getting his passes intercepted or knocked down in practice. Reports say Tannehill got so angry that he started to antagonize the practice squad defensive backs. Frustrations have been mounting for weeks, and escalated Saturday during practice prior to the game. 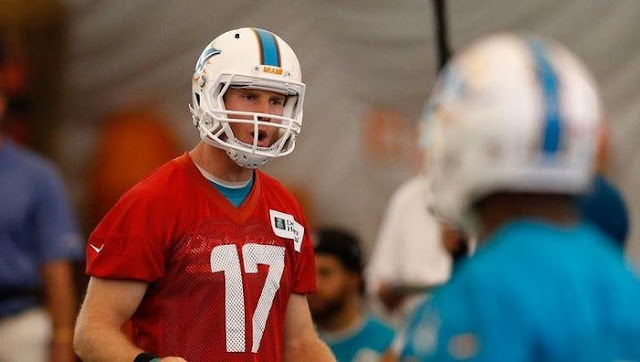 Philbin has also been struggling on how to handle his franchise quarterback, Ryan Tannehill, who had been getting rattled even in practice sessions. Sources say this has been going on for the past few weeks as the practice squad players have been intercepting Tannehill and frustrating the former Texas A&M wide receiver turned quarterback. The frustration for Tannehill stemmed from the entire situation as well as the Dolphins haven’t won a game since the season-opener. Tannehill is an extremely competitive person, and the struggles of the offense have angered him significantly. Philbin told the practice squad players to take it easy on Tannehill to not affect the young quarterback’s confidence. The idea that the Dolphins former head coach had to tell practice squad players to take it easy is laughable. Tannehill’s ribbing of practice squad players and disrespect of their paycheck speaks volumes about where he is as a quarterback.